Click HERE to view the original meeting announcement. Click HERE for the link to the map. 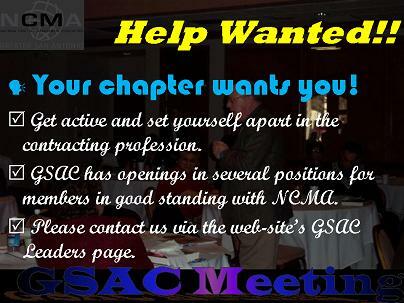 - Click HERE for the latest GSAC NCMA periodic Leader's Update. - Click HERE to find out why you should join NCMA or HERE to see the related YouTube video from NCMA Hq. 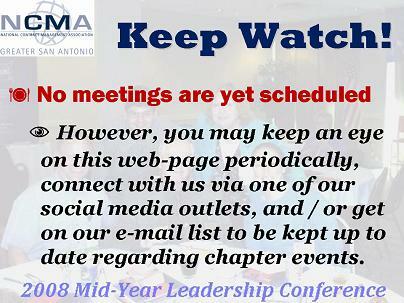 - Click HERE for upcoming NCMA events. - How did you get into this great career field? Some great testimonies as to how NCMA can help HERE. Questions / comments about these pages? Click icon to email the webmaster. We input this here since we are included within the "WebsBiggest" directory.